You can train your muscles but can you train your brain? If you’re reading this then the obvious answer would be, Yes. We can train our brains to do all sorts of complex things such as learn languages, take part in challenging debates covering a wide range of topics, operate dangerous machines with great skill, store and recall events from years past etc. Can you train your mental faculties to function in an optimal way? A way that serves you and leads to a happier, richer life. how to enjoy and evolve personal relationships and resolve negativity? So much human unhappiness is the result of an untrained mind. When you allow grievances, justified or unjustified, to fester in your head, you create barriers that make it difficult or impossible to move on. You are like a motorist that has become stuck on a roundabout. Exits, which would lead you off your current trajectory, exist but you keep on driving around in circles as if this is the only option open to you. Not so long ago, the only thing to do with something you no longer wanted or needed was to dump it. That letting go moment can be exhilarating but it can also mean you have dumped the item onto someone else or put it in a place where it will create problems for yourself and others in the future. Now, we are encouraged to recycle and sorting different materials into separate receptacles although time consuming, can produce positive feelings of having done something good for the Planet. What if you treated your thoughts this way? Toxic thoughts, reusable thoughts, thoughts to be kept and cherished, thoughts to be shared with others, thoughts that are purely personal, thoughts that lead to positive action, thoughts that require attention in order that they don’t lead to problems. Personal Mental Training must be personalized to make sense. We are not Robots. Life experience gives each of us unique insights into a very particular world view, our own. Personal Mental Training focuses on how our thoughts influence our physical and mental well-being. What is the point of knowing about anything outside of yourself if you don’t know who you are or what you really want? How are we going to find that out? By discovering how to question everything except your own existence. The fact that you are conscious of breathing, touching hearing, seeing, tasting should and does give you many advantages over other living creatures. Personal Mental Training focuses upon raising your powers of observation, restoring flexibility of thought, translating what you feel into beneficial feedback data and igniting the flame of enthusiasm that is too often lying dormant or has been set aside because of multiple failed attempts to realize a cherished idea or dream. Personal Mental Training requires commitment and dedication. My commitment is present in my offer of my unique expertise. Your commitment is required to make this work, for you. Mental deterioration and Memory Loss are not the inevitable results of growing older. Chronic Mental fatigue is a common complaint among people of all ages in our society. In addition, many people feel increasingly helpless in the face of current World events. The main difficulties arise when the same helplessness is felt in regard to issues closer to home. When unaceptible levels of Stress are reached then symptoms appear, ranging from simple forgetfulness to the syndrome known as Burnout, which has become so common that it now being talked about in terms of an epidemic. Personal Mental Training works with who you are at this moment and opens possibilities of a life in which you take control of how you feel. As a species, we are very resilient and there are legions of examples of human triumph over difficulties. Dumping a thought that you don’t want is the easiest solution. We all have unwanted thoughts that drop into our heads. They can be amusing, silly or upsetting but most of them can be quickly forgotten. Persistent positive thoughts wake us up to ideas that can lead us in new directions. Persistent negative thoughts tend to fix us in one place. They awaken deep fears and dread of both the present and the future even if the present is relatively safe and calm. I’m an artist, by which I mean that I bring creativity to everything that I do. I trained as a Dietitian in the time before “Healthy Eating” became the popular focus that it is today. The up-side is, that I got to meet the people who did all the groundwork. Researchers such as Dr Linus Pauling, Doctors Gordon and Barbara Latto of both the McCarrison Society and the Vegetarian Society, the magnificent Leslie Kenton, Health and Beauty Editor for Harpers & Queen magazine in London, Lawrence D Hills and Hilda Cherry Hills of the Henry Doubleday Research Association now known as Garden Organic and many other pioneers who highlighted the crucial role of Nutrition in the prevention and cure of degenerative disease. Our food choices have an impact on both our body and our mind. When we no longer have to eat simply to survive, we have a tendency to make food choices that are often counter-intuitive to our well-being, with instant gratification taking the place of good sense. Being responsible for how you feel, mentally and physically, is a true art. Our brains are remarkable. They deserve our attention. We really need to use them in a more creative way, rather than simply cramming them with facts and junk mail. One of the best uses to which we can apply our brains, is creating our own happiness. When I first arrived in the Netherlands from Scotland, I was unable to communicate with the verbal fluency and humor that I had previously taken for granted. Like a young child learning to speak, I had to spend more time listening than talking. I turned to photography and sculpture as a means of connecting with both myself and the people around me. I needed to find an effective way of expressing myself. 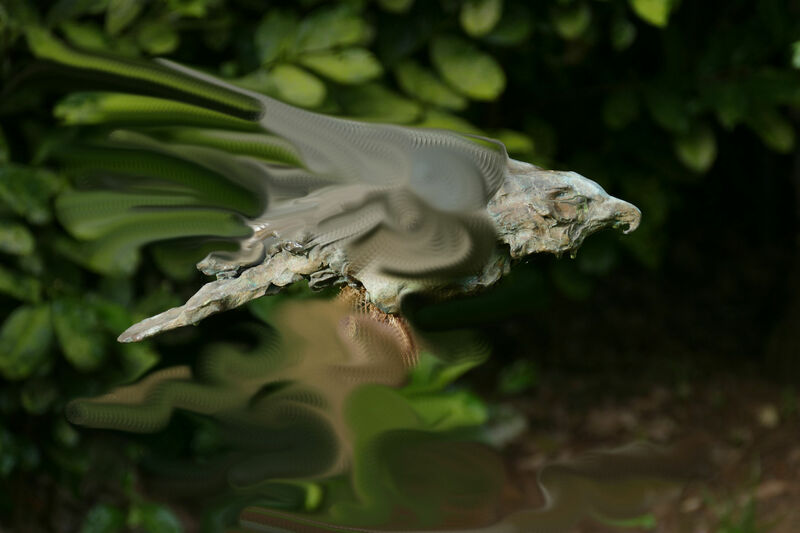 There is a sculpture of a hawk, which I made a few years ago. It is poised in that moment before flight, when its wings are still tucked close to its body, head thrust forward, mind, already at its destination, while the body is fixed in bronze. It is impossible to view this piece without feeling the tremendous potential for flight. I am impressed not by what I made, but by what I must have observed that made it possible to make a solid object that contains the essence of movement. Observation is what happens when you stop talking and start using all of your other senses. What I bring to Personal Mental Training is a lifetime of seeing and being. I understand the process of making choices and the positive impact this can have on each of our lives.